Graham Turner is currently absorbed with his latest big project, a large oil painting of the Battle of Barnet, one of the major, pivotal, battles of the Wars of the Roses. There is still a huge amount of work to do before the painting is complete, but his intention is to try to have it ready for unveiling at the Barnet Medieval Festival in June (see below). Graham's preliminary sketch shows the composition he decided upon to convey the story of those whose lives hung in the balance on this foggy Easter Sunday in 1471. Edward IV is central to the scene, dominating the picture, his banners behind him. He is in the thick of the fighting, in the midst of the brutal struggle against soldiers in the service of his one time ally, the Earl of Warwick, and Warwick's brother Montagu. Through the fog you can just make out the banners that tell the story of the collapse of the Yorkist left: Hastings' banner is being passed by Oxford's, which is now on the Yorkist flank. 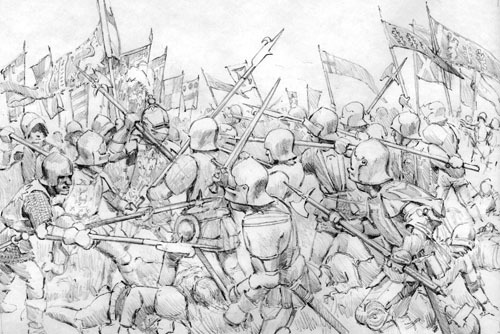 That's the basic idea - much more detail about the battle and what is shown in Graham's painting will follow in his Painting Diary. On completion, the painting will be available for sale. Graham Turner has been exhibiting his work at the Tewkesbury Medieval Festival since 1996, and will be displaying his medieval art there once again in July this year. He has also been invited to hold an exhibition at the Barnet Medieval Festival in June, the second year this event has been run following a very successful festival in 2018. Graham Turner's exhibitions will feature a selection of his medieval and historical original paintings, plus Studio 88's range of historical prints and cards reproduced from his work. Graham will be present throughout both weekends and will be happy to talk about his work and sign prints. Graham has provided a painting for the Tewkesbury Medieval Festival poster since he first exhibited there in 1996, and he also created a painting for last year's Barnet Festival. This year's posters featuring his latest paintings can be seen on the right. Both originals have sold - CLICK HERE FOR DETAILS. 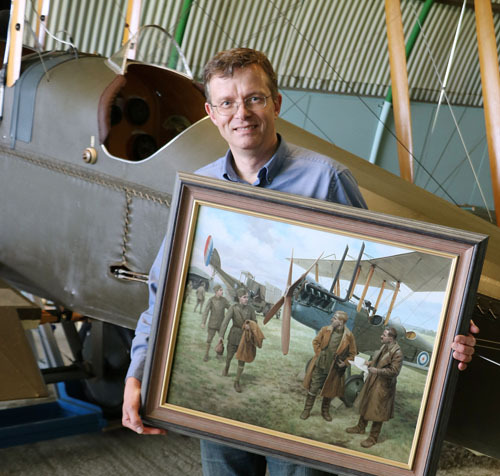 Graham Turner has been invited to once again exhibit his award winning First World War Art at Stow Maries Great War Aerodrome, as part of their 'Stow Maries at War' event on July 27th/28th 2019. (Above) Graham Turner with his painting 'Replacements' next to the WW1 Aviation Heritage Trust's BE2e at Stow Maries. (Left) Graham Turner's display of pictures at Stow Maries in 2017. CLICK HERE for details of Graham Turner's Aviation Art. Graham Turner's painting 'Dawn of the Machines' was the winner of the Cross and Cockade International Award for the best painting of a First World War subject at the Guild of Aviation Artists 2018 Aviation Painting of the Year Exhibition, held at the Mall Galleries in London. This follows previous successes, including being awarded the Wilkinsons Sword Poignard for the best work in oils at the 2017 exhibition for his widely acclaimed painting 'Letter from Home'. 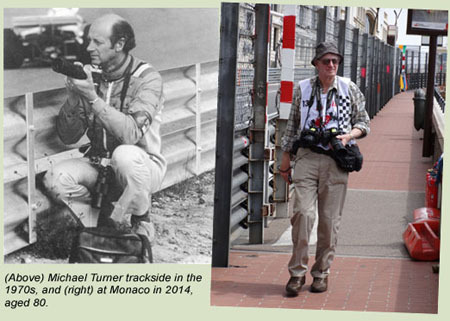 Michael Turner published his first set of Studio 88 motor sport Christmas cards back in 1963, and has produced a new set every year since, capturing the highlights of that year's season and creating a unique pictorial record of over half a century of motor racing with almost three hundred paintings, recording the spectacle, the drama and excitement of the sport that has inspired him through so many different eras. Michael was tempted to end this amazing run with the 50th set of cards in 2012, but decided he wasn't quite ready to finish something that has been part of his life for so long. However, we have now reached the point where several factors, including his own busy schedule, mean that he has regretfully decided that the time to finish is now upon us, so we are sorry to announce that the 2016 set of cards will have been the last, and there will not be a new set of cards for 2017. The cards have been collected for Michael's art as much as for use as cards, and are prized by collectors of these significant works - some of whom have been returning to buy the latest set annually since the very earliest years. We're celebrating this amazing collection of motor racing art by showing all of the paintings here on the Studio 88 website. Some of the cards are still available, including not just those from more recent years but also some of the earlier examples - CLICK HERE to see images and details of all the cards, including ordering information for those we have available. Larger prints of some of these paintings are also available. Michael Turner has travelled the globe to follow and paint the sport he loves since the 1950s. 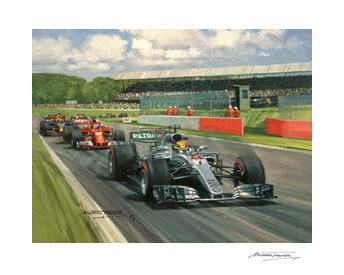 This passion and first-hand experience sets his work apart; the drama and excitement of racing cars driven on the limit, the atmosphere, the settings, all captured in his evocative paintings. Graham Turner's original painting of Henry V at the Battle of Agincourt is now part of the Royal Armouries collection and on display at the Royal Armouries Museum in Leeds. The large oil on canvas was painted to mark the 600th Anniversary of Agincourt, a battle that pitted Henry V's small and exhausted army against the massed ranks of the French nobility, made icons of Henry V and the English longbowman, and became part of English national identity. Henry V is in the thick of the fighting, surrounded by his bodyguard and with his banners flying above him, as they desperately fight off the French knights and men at arms who have struggled through the mud and barrage of English arrows to reach their antagonists. 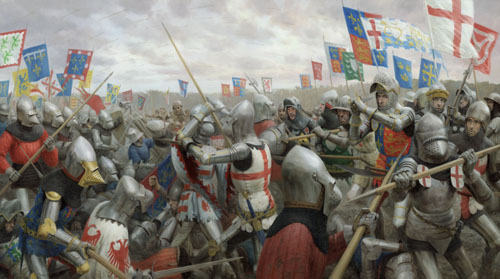 Graham Turner guides you through the creation of his epic oil painting of the Battle of Agincourt - 'the most involving, complex and time consuming project I have ever undertaken' - with a series of stage by stage photos and commentary in his latest Painting Diary - CLICK HERE to view. 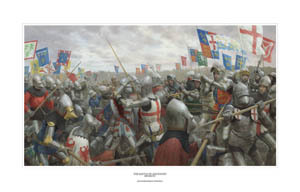 High quality prints reproduced from Graham Turner's painting of the Battle of Agincourt are available. A special canvas edition is also available, with each reproduction individually printed on very high quality canvas and stretched on wooden stretcher bars by the artist himself, ensuring a picture as close to the original as possible. Two sizes are available, the largest being almost the same size as the original oil painting - a fabulous centrepiece for any room. In July 2016 Graham Turner took part in a two-day commemorative ride on the Somme battlefield, in full cavalry kit, retracing the steps of the only cavalry action to take place during the battle, the charge at High Wood, 14th July 1916. CLICK HERE to read an article Graham has written for 'Battlefield', the magazine on the Battlefields Trust, about the charge and recounting his own experiences a century later. 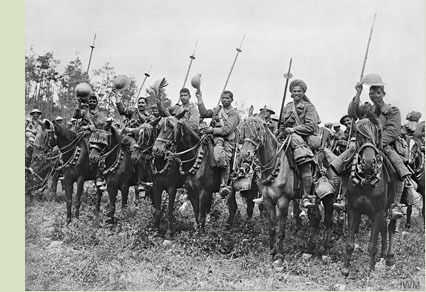 'The Great War holds a terrible fascination for me, and my own personal love of horses inevitably makes their involvement in this horrific conflict particularly poignant. I am honoured to be taking part in this commemorative ride, and as we visit the various locations and cemeteries on our route we will remember those whose lives were lost, both human and equine. Following the success of Graham Turner's exhibition at the National Civil War Centre in Newark, the Centre have purchased the entire collection of 26 works that were on display. 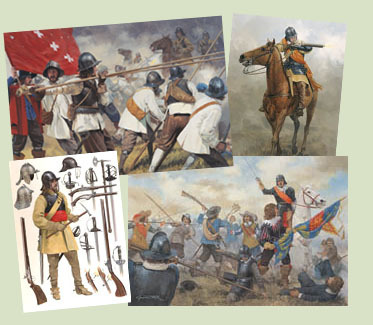 CLICK HERE FOR DETAILS of a large selection of prints reproduced from Graham's paintings of the English Civil War. "I have finally got round to creating a page on Facebook to showcase my work. I will use it to show examples of my art - both historical and motorsport - new paintings and prints, work in progress and forthcoming exhibitions. I hope this will give you further insight into what goes into the creation of my work, and keep you updated about what's currently on my easel" - Graham Turner. CLICK HERE to take a look at Graham's Facebook page and 'Like' it to receive news and updates about his work.